One of the skills I’m learning in culinary school is how to fabricate meats. What once was a very intimidating process, is now a proficient experience. I can honestly say I’m comfortable with butchering a whole chicken! 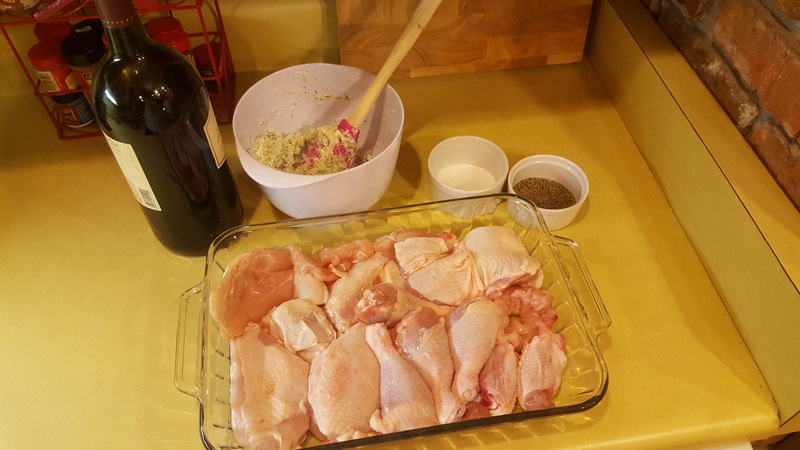 And while fried chicken is one of the most popular ways to eat various pieces of the bird, I’ve found another delicious way to prepare it: Italian Chicken in Red Wine. Herbaceous, succulent and pretty on the plate, the recipe is inspired by one of my vintage cookbooks, “The New York Times Weekend Cookbook,” by Jean Hewitt published in 1976. Great recipes never go out of style, but I’ve updated this one a bit with dried herbs and used minced onion instead of shallots. Perfect for entertaining or for a special dinner for two, the dish is easy to prepare with little prep work. If you’d prefer using boneless skinless chicken breasts, they can easily be substituted for whole chicken pieces. However, if you’d like to learn to fabricate a whole chicken, I recommend watching this YouTube video from the Culinary Institute of America. Knowing how to cut up your own chicken is a valuable skill and allows you to save money. Compound butter, chicken pieces, salt, pepper and red wine. 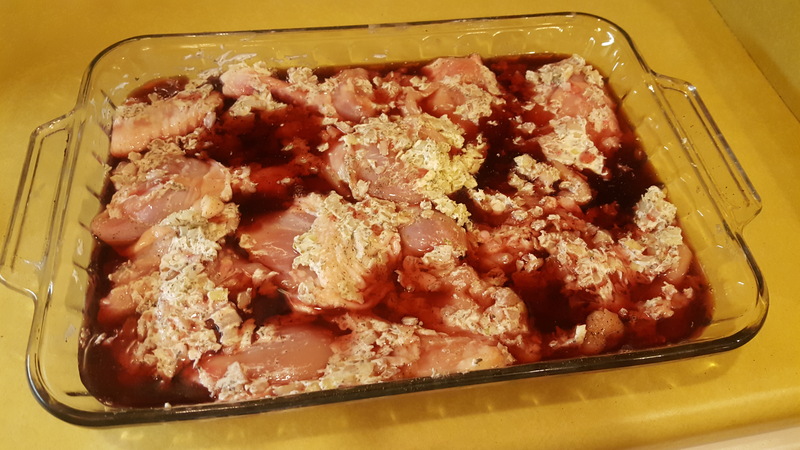 Italian Chicken in Red Wine prepared for the oven. For a showstopping fall supper, I like to serve this dish with my roasted Brussels sprouts with bacon and Parmesan cheese, alongside spiced apples. Place cut chicken pieces in a 9 x 13 casserole dish. Season on both sides well with salt and pepper. Prepare compound butter: Add dried herbs and minced onion to softened butter and mix well. Smear the chicken breasts with the butter mixture until all pieces are coated. Pour red wine over the chicken breasts and up the sides of the dish. Bake at 425 degrees for 40-45 minutes or until a thermometer reads 165 degrees when inserted in the thickest part of the meat.